Could your home’s landscaping use a little TLC? If you’re ready to take it up a notch, Suwanee, GA, landscape designers have some tips for you. 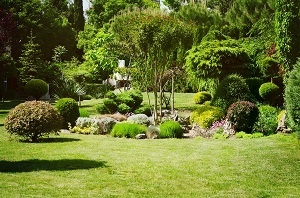 Taking your yard from brown and boring to green and inviting is easier than you think. Some people balk at this stage because they feel constricted by planting diagrams and such. However, planning is very important before you dig because you need to know where underground utilities run. The last thing you want is to plant beautiful plants, bushes, and trees to find out you’ve planted too close to the sewer line. Fixing this mistake is timely and costly. Planning also protects your landscape design in Suwanee from unexpected delays because you don’t have the correct equipment. Some projects require backhoes, stump grinders, etc. Without these tools, you’re stuck in limbo. Make sure you know where to rent large equipment and what type of tools to leave to the pros. Where do you want guests to see when they walk up the sidewalk to your house? What’s going to give your home that one-of-a-kind curb appeal? For some people, it’s an ornamental tree or bush. For others, it’s a hardscape accessory like a retaining wall or a water fountain. Decide what your landscaping’s focus point is and start building out from it. Some plants grow well in the area, while others do not. For example, plants that need a dry, desert climate are not ideal for landscaping in Suwanee. Many people resist creating elaborate flower gardens because they don’t think they have a green thumb. The truth is that most people plant the wrong things. When you stick with plants that are natural to the area, less maintenance is required. The plants grow easier with less work from you. In some cases, you may not even have to spend as much time and money watering because the plants get what they need from Mother Nature’s natural weather patterns. 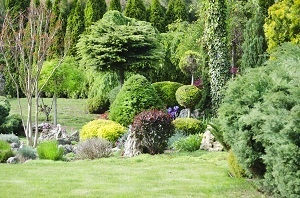 Your landscaping is a work of art, but not a painting that hangs on the wall. It needs plants that don’t just sit there. Add in a mixture of tall grasses that move in the wind. Also, consider plants that invite wildlife like hummingbirds for life. Let go of your idea of what the landscaping should look like and pick some plants just because. Forget being practical. Go big. But, don’t go all out. When trying new plants, choose one or two to see how they do in the garden. Sometimes, you need a little help. Landscape contractors in Suwanee help homeowners of all shapes and sizes of yards design beautiful soft and hard landscapes. Call a local contractor today!